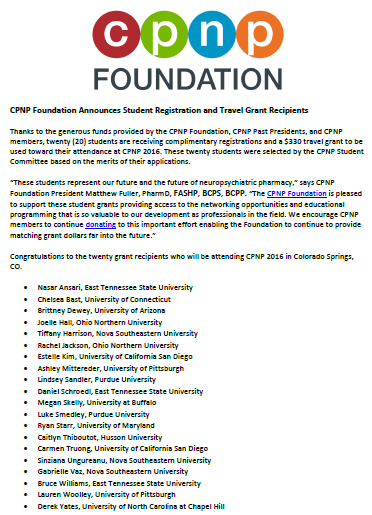 Thanks to the generous support of the CPNP Foundation, CPNP Past Presidents’ Destiny Fund, and CPNP members, twenty (20) students are receiving complimentary registrations and a $285 travel grant to be used toward their attendance at CPNP 2019. These twenty students were selected by the CPNP Student Committee based on the merits of their applications. The CPNP Foundation is pleased to announce the recipients of the third annual Defining the Future Research Grant Awards. 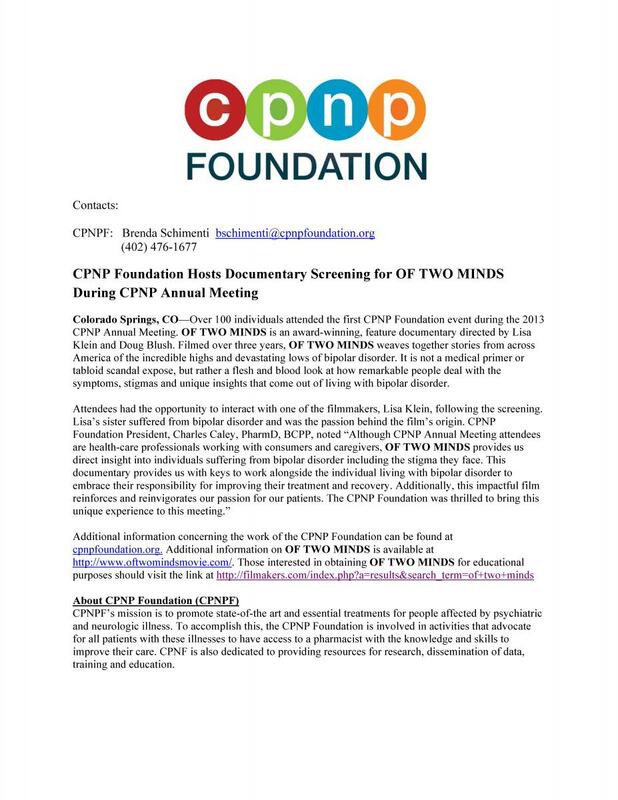 With nearly double the amount of applications from 2017, the CPNP Foundation was incredibly encouraged by all of the people who are working to improve the lives of people living with mental disorders and their caregivers. Thank you to everyone who applied and is doing this important research! Defining the Future Grants are awarded annually. Applications are due late summer, and recipients are announced in early October. Pharmacy students, residents, and fellows are eligible to apply. Now is the time to start thinking about your research project and planning to submit it for consideration for a 2019 Defining the Future Grant. Stigma Study Results Published: Community pharmacists and mental illness: a survey of service provision, stigma, attitudes and beliefs. The results of a CPNP Foundation-sponsored study about stigma and community pharmacists have been published in the International Journal of Clinical Pharmacy. The paper, Community pharmacists and mental illness: a survey of service provision, stigma, attitudes and beliefs, is the culmination of a research project between the Foundation and collaborators at Duquesne University Mylan School of Pharmacy. Led by Dr. Vincent Giannetti, the team sought to explore community pharmacists’ knowledge of and attitudes toward mental illness, comfort and confidence in dealing with persons with mental illness, and the services they provide to this patient population. Thanks to the generous support of the CPNP Foundation, CPNP Past Presidents’ Destiny Fund, and CPNP members, twenty (20) students are receiving complimentary registrations and a $325 travel grant to be used toward their attendance at CPNP 2018. These twenty students were selected by the CPNP Student Committee based on the merits of their applications. Congratulations to the twenty grant recipients who will be attending CPNP 2018 in Indianapolis, Indiana! The CPNP Foundation is pleased to announce the recipients of the third annual Defining the Future Research Grant Awards. There were many applicants who submitted exciting and important project proposals, and we thank everyone who applied. 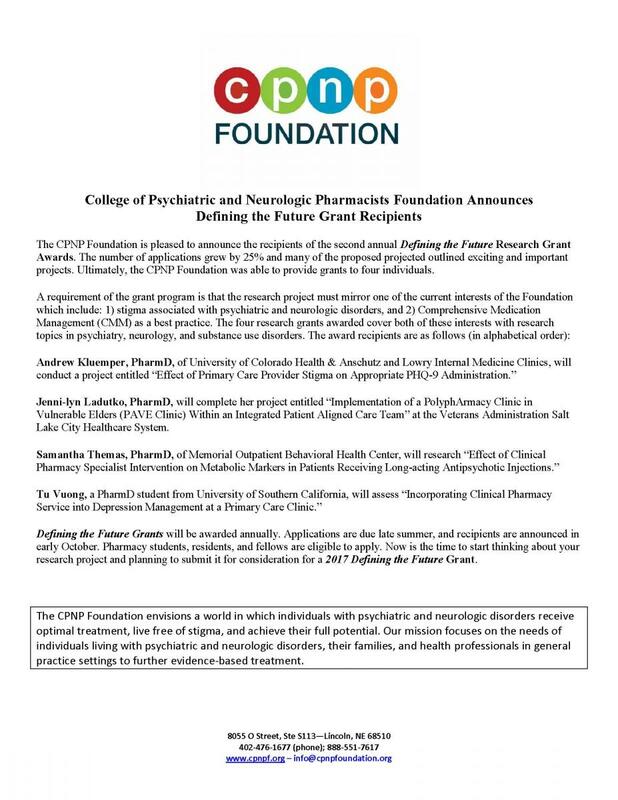 Ultimately, the CPNP Foundation selected three grant recipients. Defining the Future Grants are awarded annually. Applications are due late summer, and recipients are announced in early October. Pharmacy students, residents, and fellows are eligible to apply. Now is the time to start thinking about your research project and planning to submit it for consideration for a 2018 Defining the Future Grant. The CPNP Foundation is pleased to announce that they will support students at the 2018 CPNP Annual Meeting, April 22-25, 2018, in Indianapolis, IN. The Foundation will offer 20 student registration and travel grants valued at $500 each as well as an 8-hour course that offers participants the chance to become Mental Health First Aid certified. Students interested in being awarded a registration and travel grant should apply online by January 17, 2018. To be eligible, a student applicant must be a full-time pharmacy student in pursuit of her/his first professional pharmacy degree, a paid student member of CPNP in good standing, and they must not have previously received this grant. Mental Health First Aid is an 8-hour training developed to teach participants how to help someone who is developing a mental health problem or experiencing a mental health crisis. The evidence behind the program demonstrates that it helps trainees identify, understand and respond to signs of mental illness and substance use disorders. The course will be offered to students over two days, April 21-22, and registration will be available starting in November. Thanks to the generous donations provided by the CPNP Foundation, CPNP Past Presidents, and CPNP members, twenty (20) students are receiving complimentary registrations and a $325 travel grant to be used toward their attendance at CPNP 2017. These twenty students were selected by the CPNP Student Committee based on the merits of their applications. Congratulations to the twenty grant recipients who will be attending CPNP 2017 in Phoenix, AZ! Effective January 1, 2017, Cynthia “Cindy” Kirkwood, PharmD, BCPP joins the CPNP Foundation Board of Directors serving a three-year term on the Foundation Board. Dr. Kirkwood is a Professor and the Executive Associate Dean for Academic Affairs at Virginia Commonwealth University in Richmond, VA and joins the Foundation Board as President-Elect. The Foundation would also like to recognize the contributions of outgoing Board member Judy Curtis, PharmD, BCPP, FASHP, who served on the Board from 2014-2016. Dr. Curtis was a Founding Circle Donor to the CPNP Foundation and currently works as Director, Medical Science Liaison-MidAtlantic for the Clinical Development and Medical Affairs-CNS division of Sunovion Pharmaceuticals Inc. The CPNP Foundation is pleased to announce the recipients of the second annual Defining the Future Research Grant Awards. The number of applications grew by 25% and many of the proposals projected outlined exciting and important projects. Ultimately, the CPNP Foundation was able to provide grants to four individuals. 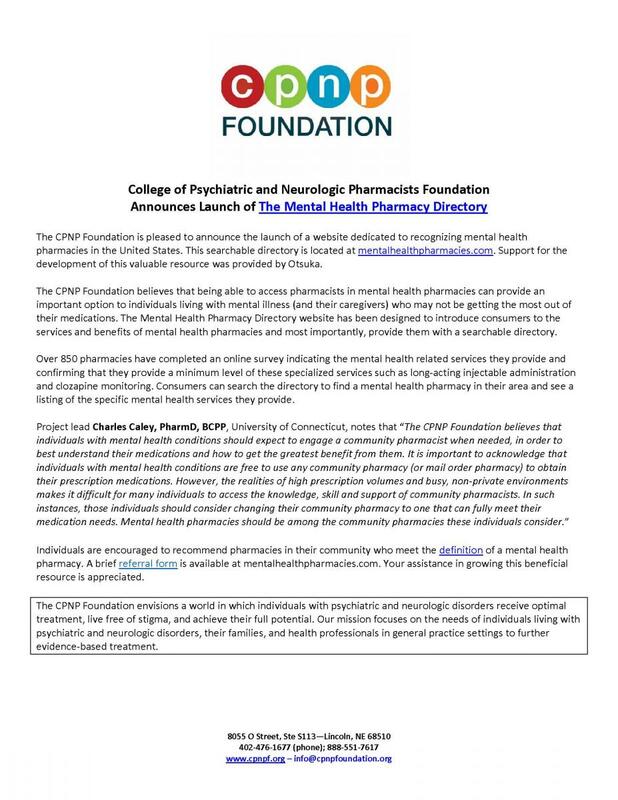 The CPNP Foundation is pleased to announce the launch of a website dedicated to recognizing mental health pharmacies in the United States. This searchable directory is located at mentalhealthpharmacies.com. Support for the development of this valuable resource was provided by Otsuka. 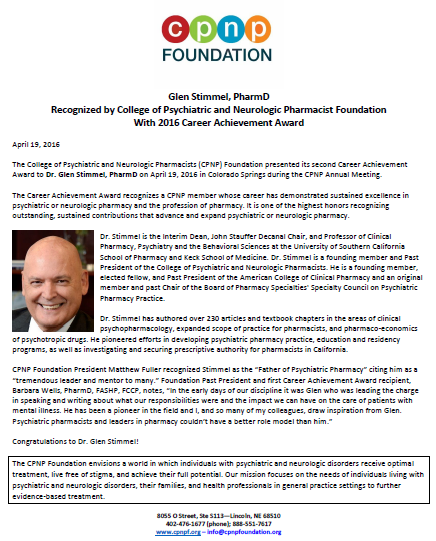 The College of Psychiatric and Neurologic Pharmacists (CPNP) Foundation presented its second Career Achievement Award to Dr. Glen Stimmel, PharmD on April 19, 2016, in Colorado Springs during the CPNP Annual Meeting. The Career Achievement Award was established by the CPNP Foundation to recognize a CPNP member whose career has demonstrated sustained excellence in psychiatric or neurologic pharmacy and the profession of pharmacy. It is one of the highest honors recognizing outstanding, sustained contributions that advance and expand psychiatric or neurologic pharmacy. Thanks to the generous funds provided by the CPNP Foundation, CPNP Past Presidents, and CPNP members, twenty (20) students are receiving complimentary registrations and a $330 travel grant to be used toward their attendance at CPNP 2016. These twenty students were selected by the CPNP Student Committee based on the merits of their applications. 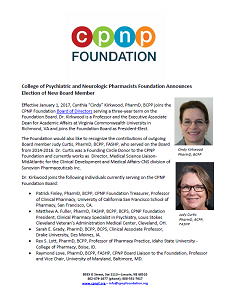 The CPNP Foundation Board of Directors has elected four individuals to serve three-year terms on the Foundation Board. The new Board members are Drs. Sarah E. Grady, Rex S. Lott, Gene H. Makela, and Carol A. Ott. 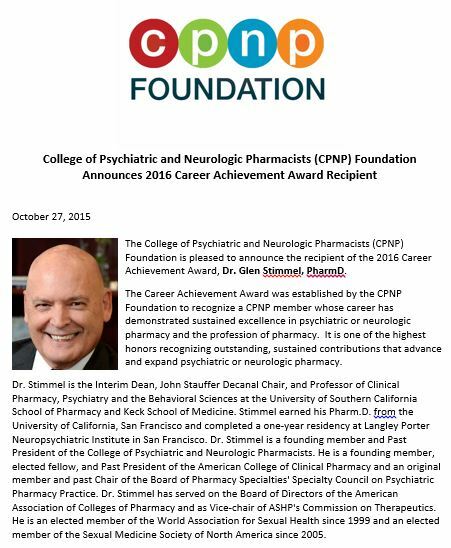 The College of Psychiatric and Neurologic Pharmacists (CPNP) Foundation is pleased to announce the recipient of the 2016 Career Achievement Award, Dr. Glen Stimmel, PharmD. 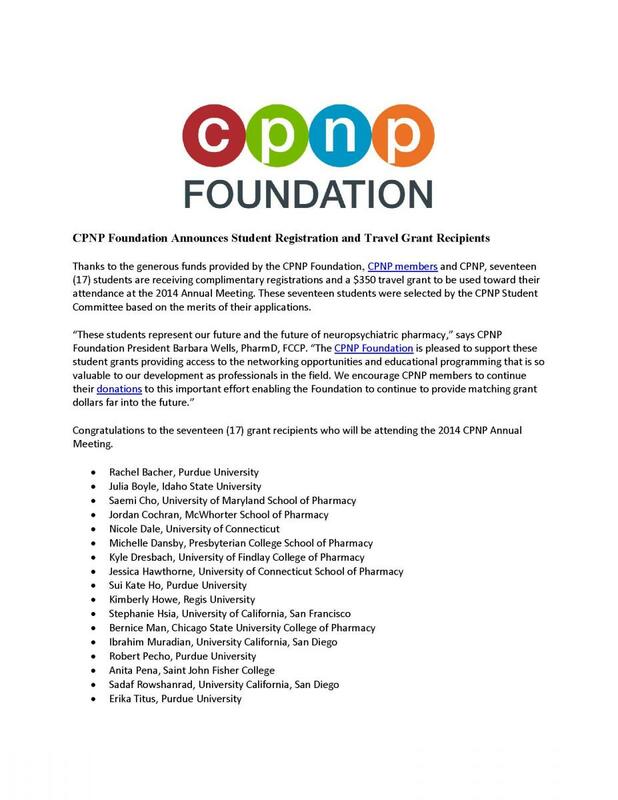 Thanks to the generous funds provided by the CPNP Foundation and CPNP members, fifteen (15) students are receiving complimentary registrations and a $330 travel grant to be used toward their attendance at the 2015 Annual Meeting. These fifteen students were selected by the CPNP Student Committee based on the merits of their applications. 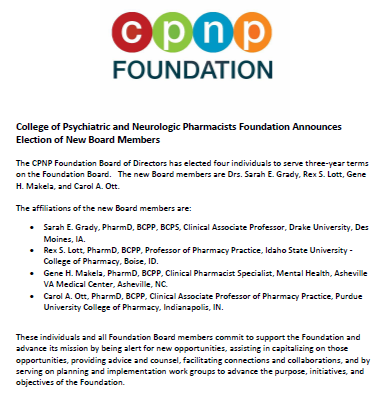 The CPNP Foundation Board of Directors has elected five individuals to serve three-year terms on the Foundation Board. The new Board members are Drs. Matthew A. Fuller, Patrick Finley, Jerry R. McKee, Dean M. Najarian, and Michael Z. Wincor. Dr. Fuller will serve as President Elect, and he will become the Foundation’s President on January 1, 2016. 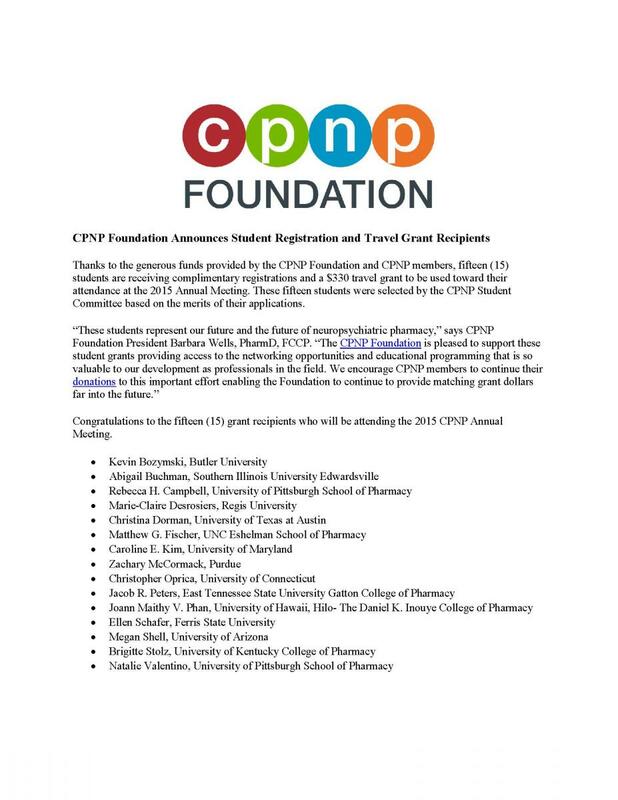 The CPNP Foundation is pleased to announce they have recently given a grant in the amount of $7500 to support the attendance of 15 pharmacy students to the 2015 CPNP Annual Meeting to be held April 19-22, 2015 in Tampa, Florida. 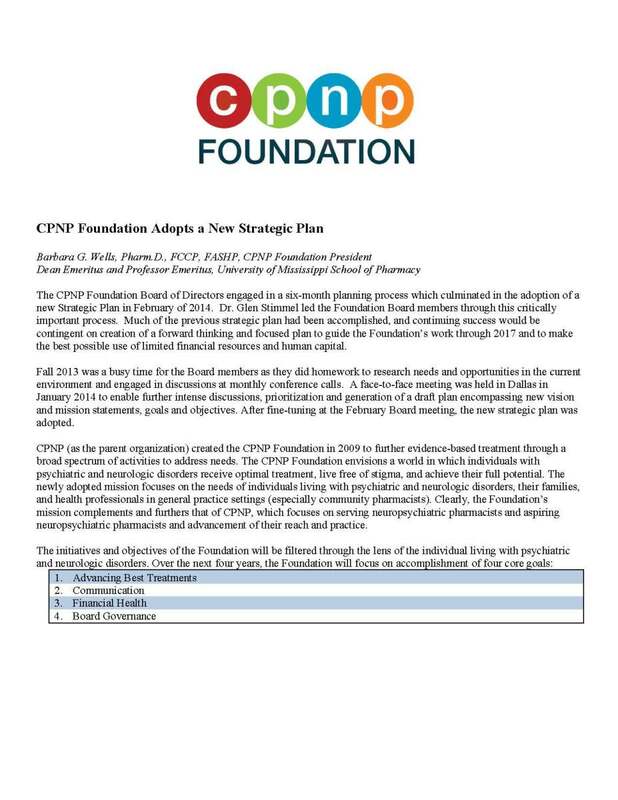 The CPNP Foundation Board of Directors engaged in a six-month planning process which culminated in the adoption of a new Strategic Plan in February of 2014. Dr. Glen Stimmel led the Foundation Board members through this critically important process. Much of the previous strategic plan had been accomplished, and continuing success would be contingent on creation of a forward thinking and focused plan to guide the Foundation’s work through 2017 and to make the best possible use of limited financial resources and human capital. Thanks to the generous funds provided by the CPNP Foundation, CPNP members and CPNP, seventeen (17) students are receiving complimentary registrations and a $350 travel grant to be used toward their attendance at the 2014 Annual Meeting. 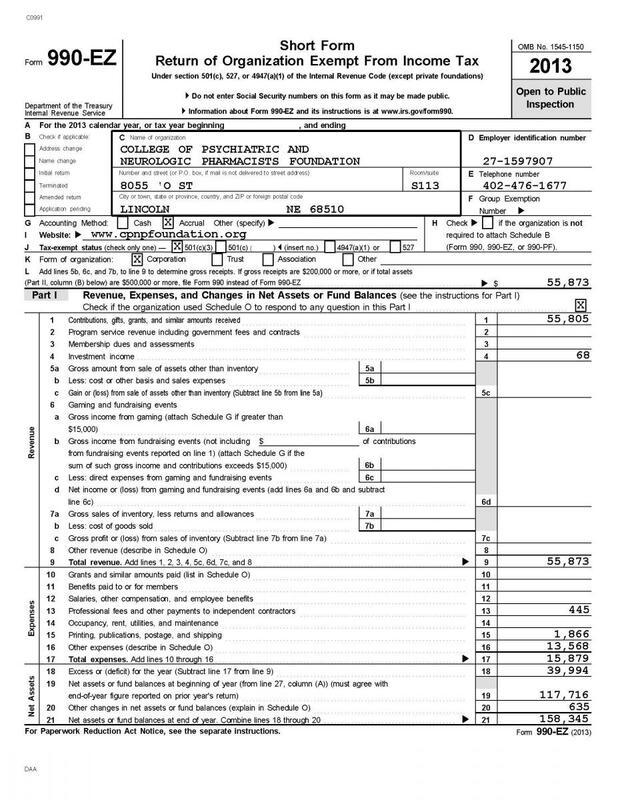 CPNPF is pleased to provide a full reporting of its 2013 financial activity via the IRS Form 990 report. 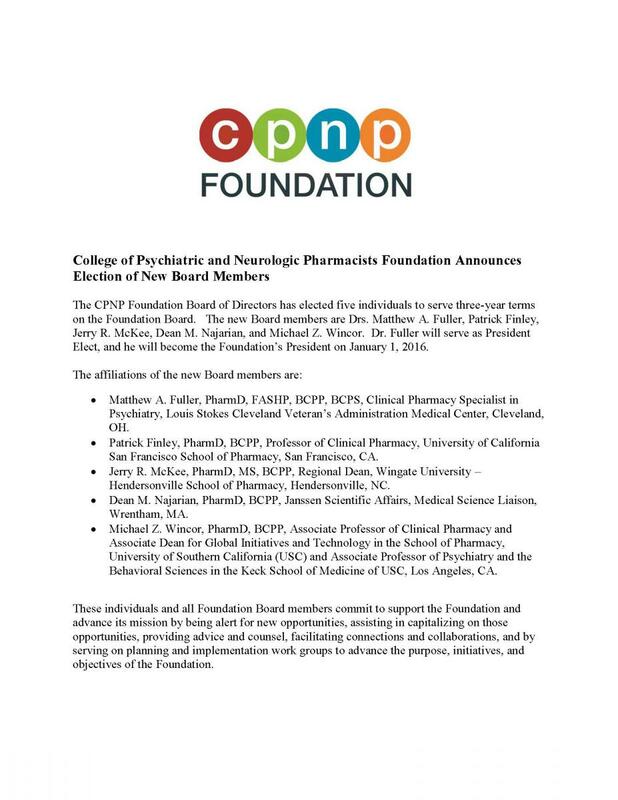 The College of Psychiatric and Neurologic Pharmacists Foundation (CPNP Foundation) announces officer transitions and new appointments to the Foundation Board of Directors. Colorado Springs, CO—Over 100 individuals attended the first CPNP Foundation event during the 2013 CPNP Annual Meeting. OF TWO MINDS is an award-winning, feature documentary directed by Lisa Klein and Doug Blush. Filmed over three years, OF TWO MINDS weaves together stories from across America of the incredible highs and devastating lows of bipolar disorder. It is not a medical primer or tabloid scandal expose, but rather a flesh and blood look at how remarkable people deal with the symptoms, stigmas and unique insights that come out of living with bipolar disorder.